This is one of the few books that I stopped reading part of the way through. The thing read like a dictionary (not even an encyclopedia!). With such an interesting topic, I would think that it would be hard to write a boring book, but here it is!The book "details" visual pranks pulled at MIT over the years, but with little detail (i.e. "and the dome got decorated like R2D2..."). There is very little how, or why, or reaction from the public chronicled, which is what I expected and what makes the story interesting.Thanks to my husband's research (he's an MIT alumnus and didn't like me badmouthing anything remotely connected to the school), he found that this is a subset of material that the MIT museum has on the subject, and that a far better book is "Journal of the Institute of Hacks, Tomfoolery, and Pranks" by Brian M Leibowitz. If you're interested in a more entertaining book, I'd suggest that one even though I haven't read it. It can't be worse than this one! Well, I wish GoodReads had a more sophisticated review system, because I would use one for this review.The subject matter is fantastic. I love reading about and participating in pranks/hacks, so a book about this sort of thing at MIT is bound to be good. When I was growing up, Real Genius was one of my favorite movies. I was so excited about going to college, because I figured that it would be half high-tech classes and half hi jinks. Little did I know...Anyway, the subject matter is delightful, but its treatment here is a bit lacking. The photos of the hacks, an essential element when discussing this stuff, are of poor quality and are only black and white. Plus, there are no photo captions (!) although the adjoining text usually explains it.The organization of the book also leaves much to be desired. The hacks are divided up by type and then the highlights are given, but there are frequent repetitions, and no real progression. Sprinkled in to all of this are "essays" by various students, alum and staff about hacks and hacking. They are pretty much just thrown in there.Anyway, it is a short but generally enjoyable read, but this is in spite of, and not because of, the construction of the book. I guess good subject matter can save you every time. An amusing survey of the best hacks perpetrated by M.I.T. 's student body over the past century (and then some). Were the photography of slightly better quality, this would be the ultimate coffee table book for the geekish household. Of course, given the short lifespan of most of these hacks, one can understand why some of the pictures are less than perfectly framed.I wish this book had provided a bit more insight into the school's culture of hackerdom, rather than repeatedly brushing over the surface (they're engineers, they're geeks, they're giddy from cramming thermodynamics for sixty hours straight). This is true of plenty of students at plenty of universities: why only at M.I.T. have students raised pranks to an art? Care to connect the dots between hacking on top of the Great Dome and thinking outside of the corporate box? Would that Peterson, the Institute's historian, had asked a sociologist or anthropologist buddy to flesh out his text, because I wanted there to be more discussion of the hackers' ethos and ideals. 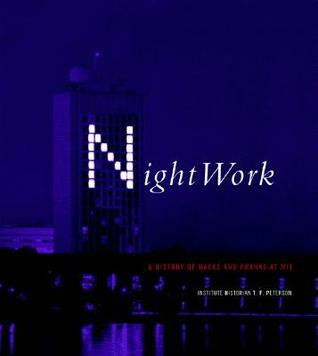 I received Nightwork : A History of Hacks and Pranks at MIT as a birthday present from my brother. A relatively slim (173 pgs) oversized volume, Peterson discusses the tradition of pranking (known as "hacks") at the Massachusetts Institute of Technology in Boston. Unlike many other colleges, MIT adheres to a strict hack code - no permanent damage is to be done, hacks are always anonymous, and there's usually both an element of parody and of the absurd. Technology & creativity also figure highly in the hacks. The hacks are grouped by type, with black & white photos (unfortunately of varying quality) interspersed within the text; a nice section of color photos is included in the middle of the book. One of the last chapters includes essays on hacking, written by professors and administrators, as well as students and alumni. A glossary of slang and a sources list (that could be more detailed) is included as well. A fun read for anyone interested in the more sophisticated form of college tomfoolery. Hacking is a long tradition of elaborate pranks at MIT, and this book covers both the hacks themselves, and some of the culture that causes them to thrive. It's impressive that the hacking culture prides itself on both its anonymity and in making sure that its hacks do no harm, which is no doubt why they are so successful. The style can be a bit dry at times, but my main complaint is that there aren't more pictures of the hacks (although there are a fair number of them). The books was OK, and was a reasonable overview of the subject. I also could have wished for greater illustrations or photographs, but given the subject matter, perhaps its not quite possible. The folks at MIT know how to have fun. Interesting idea to catalogue and even physically document MIT hacks, some stupid and some brilliant. Wish the photographs were better and captioned; some repetition.